This story of superheroes and supervillains takes place in the fictional Californian city of San Ventura, home to the Cowl, the world's last supervillain. Standing against this menace are the Seven Wonders, the city's superhero team. However some of the citizens of the 'shining city' are not happy with this arrangement. Some are scared of the criminal mobs who claim to be doing the Cowl's work and make the streets unsafe, while some detectives in the city's police force can't help noticing that the Seven Wonders don't stop a lot of crime. The lives of some non-powered folks are going to change dramatically as they are pulled into the schemes of the super-powered and everyone in San Ventura and beyond must cope with coming changes. This is a fun book that keeps the pace and action going throughout. There are twists and turns from the start, and while I saw some of them coming (I'm aware of superhero tropes) there are surprises even for the genre savvy. I found this book more enjoyable (and less confusing) than the author's previous novel Empire State, though I suspect that's because I'm more familiar with superhero stories than with noir. The main characters are well written, with the narrative giving a glimpse into the mindset of each. There are various shifts in alignment and its a testament to the author that these don't feel unlikely. The titular superhero group mostly aren't viewpoint characters and so they do feel a little flatter, though they are meant to be aloof during the start of the story so its no surprise we hear about them more than we see them. I particularly liked that two of the most dynamic characters in the book are women, and that they lead or steer the action quite a bit of the time. It's also cool that the motivations they are given are ones that are traditionally assigned to male characters in comic books. The setting felt familiar in a good way, and by that I don't just mean San Ventura (I have never been to California), but the whole set up. It's a superhero world, albeit one with very few active superheroes, and it manages to blend the feel of different comic book traditions. There's almost a tussle between the clean-cut all-American comic book tradition of the super team's public face and the darker, seedier underbelly of supervillains, criminals and superheroic compromise. These different parts of this world exist together and there are also glimpses of the more mundane existence lived by the ordinary, unpowered folk. It is good that they aren't forgotten as some superhero stories tend to focus on blasting and punching as opposed to the concerns of normal life. 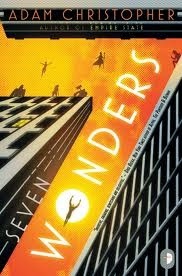 Seven Wonders is a fun, action-packed novel that doesn't skimp on characterisation or emotion. Picard must understand and apply a complex treaty without Data's help. Data must persuade some people to do something they don't want to do without Picard's help. There is no one of the rank of Ensign featured in the episode and Wesley only gets one line, so that's not what the title is about. 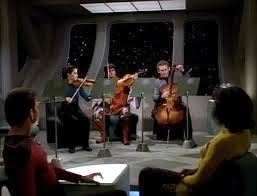 Data is playing a string instrument concert with O'Brien, a Vulcan and a blueshirt. Data tells Picard and Dr Crusher to come back when someone else is playing because he's been told his playing lacks soul. Picard explains the downside of excessive honesty, and is called away by a message. The Shelliac aliens (who probably don't have anything to do with nail polish) notify Picard that there are humans on a planet that belongs to them. The Federation have 3 days to remove the humans as per a treaty, after that the aliens will destroy the human vermin. The planet has fatal radiation that interferes with scanners, transporters and weapons. Dr Crusher reckons that the humans must have adapted to the radiation (adapting to radiation you can't survive is a neat trick). 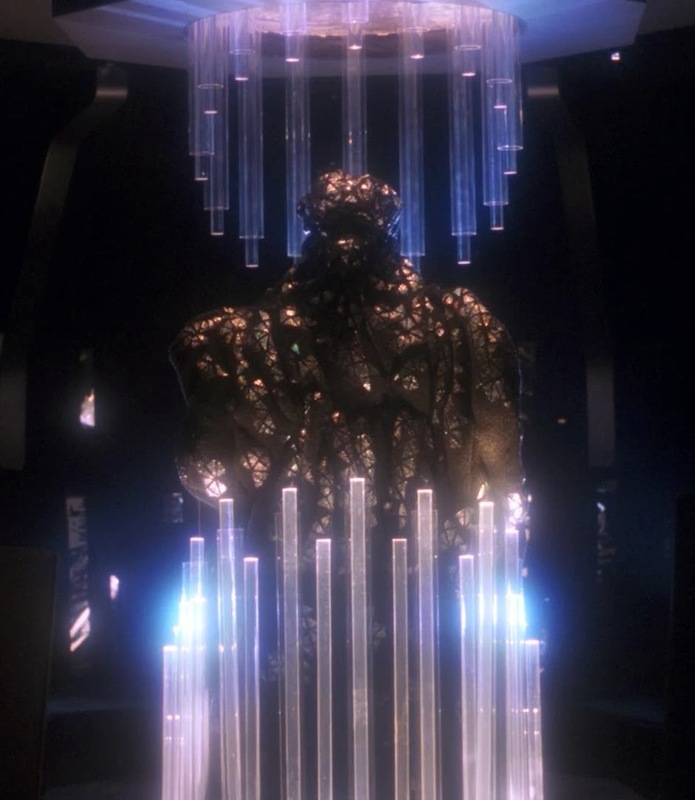 Data is sent to start the evacuation as he's the only one who can survive there (it seems the radiation also affects Klingons, Vulcans and any other non-human races on the Enterprise). Data's arrival surprises 2 talkative men with capes. Their ancestors settled there 92 years ago after their Federation ship got lost, it took a lot of work to survive the radiation and create a settlement. There are now 15,253 people, it's impossible to evacuate that many by shuttle in 3 days. Data is taken to their leader, who seems mildly surprised to see an android and refuses to believe anything Data says and won't evacuate. A lady helps Data, she is very interested in him and asks a lot of technical questions, despite never seeing an android before. Further attempts to explain the situation to the leader result in denial and the leader going on about the history of the settlement. 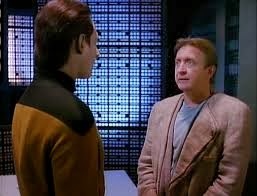 Data tries talking to people individually, most don't believe him, or think they can fight or negotiate. Data tries asking Picard and Riker for guidance, but they are having no better luck. Data goes to a public meeting where the leader successfully uses rhetoric and inflated civic pride against facts, even though Data tries to appeal to them emotionally and even mentions dying children. Some colonists are mildly concerned about their impending deaths and meet with Data separately. Riker insists that Geordi and O'Brien make the transporters work, they try even though it's impossible. It will take Star Fleet 3 weeks to send a fully equipped colony ship. Picard tries to negotiate for more time with the aliens, who stick to the treaty and refuse to hear any argument outside it. They will arrive in 3 days, kill any humans they find and colonise, as is their right. Picard and Troi look at the big, complex treaty and Troi explains why a basic concept of Star Trek is deeply improbable. 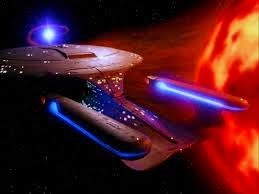 Picard takes the Enterprise to intercept the aliens, who let Picard beam over, but still won't listen to him. Data holds a meeting in the lady's house where some people hear Data out and think that maybe they should evacuate, but only if the leader can be convinced. The leader arrives, tells everyone off and attacks Data, which he sees as turning off a machine rather than an act of violence. This means that the evacuation is off, for some reason. The lady somehow reactivates Data and he realises that actions speak louder than words. He makes a phaser from household items (don't try that at home), stuns a group of guards then destroys the town's vaunted aqueduct. He explains that the aliens are numerous with stronger weapons and will probably kill them all from orbit (it is the only way to be sure), so they won't have a chance to fight. This makes the colonists understand and even the leader agrees they should prepare to evacuate, though he wanted to die for the settlement. Picard decides to really look at the treaty, gets the senior staff to read it, then finds a section about 3rd party adjudication. He tells the aliens that he'll get a hibernating race to adjudicate when they wake in 6 months, or they can give him the three weeks he's asking for. The aliens aren't happy but they agree. Geordi and O'Brien say they can get the transporters working if they have 15 years and a +100 research team. The evacuation plan goes well and the lady says goodbye to Data. She wants some emotional connection from him, but Data claims he doesn't have emotions. The message of the scene is that Data is purely rational. 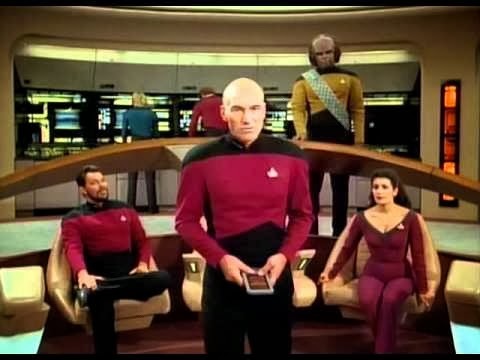 Picard advises Data that excessive honesty is bad, especially in a command position, as advertising your flaws stops your crew from having confidence in you. Plus you'll start to believe in your limitations. Picard tries to deal with the aliens' demand and adherence to the treaty. His attempt to speech at them fails because they rudely hang up. Although he refers to the treaty it takes him a while to actually look for a solution somewhere in there. It's a complex document that was made over a century ago by +300 legal experts, even so it seems a bit odd that he and Troi were apparently skim-reading it before. It's also odd that there are no lawyers on the Enterprise. I'd have thought there should be trained lawyers, or at least someone with a law degree, I mean they have (or possibly had) a fiction expert... on the spaceship. When Picard takes the time to properly look at the treaty with the senior staff (not even a paralegal to help out) he discovers the loophole. A 3rd party can be brought in to adjudicate and he chooses a race currently in hibernation for another 6 months. He gives the aliens the options, then he hangs up on them with great satisfaction. In a moment of bonding Riker ad Picard finish each others sentences while explaining (apparently to each other) that the aliens will destroy all the humans and they'd be entitled to do so. And thus the stakes are explained. In this episode Riker plays the role of that manager who tells you to do something difficult/impossible then motivates you by repeating what he's asked you to do and assuming you'll get it done despite your objections. He kind of gives Data advice, but he doesn't help Geordi and O'Brien at all. He just wanders in on them modifying the transporters and gets on their backs about it. Data has trouble understanding why no one will listen to him and his plainly stated facts. The lady explainsthat humans have various flaws that he does not, and helps him by suggesting he try reverse psychology and emotional language. Of course Data can't play that game the way a human can, plus he's a weird-looking, non-human stranger whereas the leader is apparently respected so much that people would rather risk dying than go against his word. Data doubts his ability to accomplish his task. The lady kisses him because he's feeling down (because that's a thing people do?) and Data entirely wrecks the moment by analysing the kiss and asking what it was about. At the end of the episode the lady suggests Data might have some fondness for her and he is perplexed by the notion, which disappoints her. He kisses her, but only because it mirrors her kissing him earlier. Apparently Data has been chemically castrated (or whatever the android equivalent is) since the Naked Now because he not only feels no affection, he entirely fails to recognise it. Troi -in her secondary role as Picard's secretary- explains the circumstances surrounding the treaty and communications issues with the Shellac aliens, who cannot be read telepathically or empathically. She also demonstrates to Picard why any interplanetary communication is highly improbable, even among species that have some common reference points. Yes, many different aliens being able to communicate easily with each other, even using roughly the same methods of communication, it the does seem to good to be true, doesn't it? Troi asks Picard who they have to help with the treaty, and Picard says it's just the two of them. I dunno, it seems like he could probably find someone to help out. Geordi and O'Brien attempt to follow impossible orders and get the transporters working. Wes helps but even he doesn't think it can be done. Riker ad Picard wander through every so often telling them to get on with it. 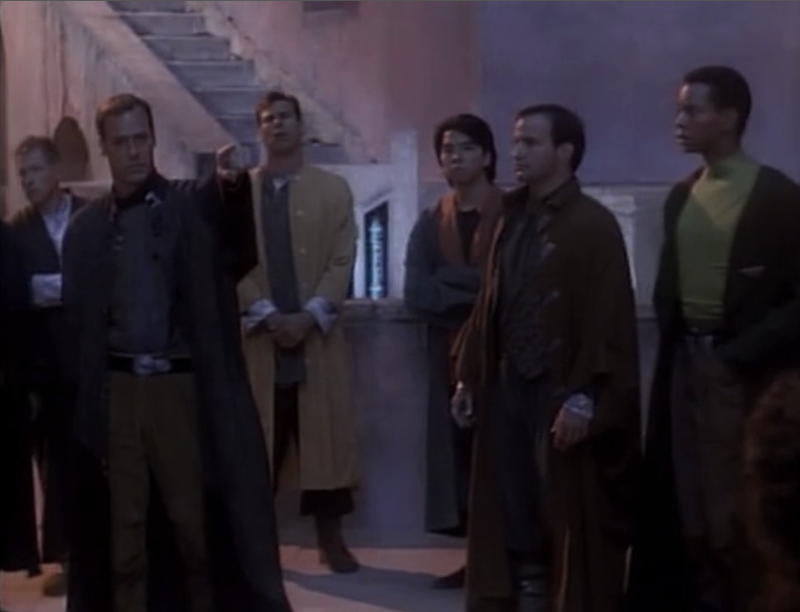 Wesley questions this, but Geordi says that's just what captains do. These are the things are engineers know. The people of the settlement may not believe Data and if they don't their actions make sense. They trust their leader enough to make that decision; though you'd think those who were present might be concerned that he has reached his decision without giving it any thought, or checking anything, or even coming up with a reason why Data would lie to them. Later its clear that some people do believe Data, or are concerned enough to hear more from him, but even then they refuse to let Data help them unless the leader agrees. At the point that you believe your leader's decision will lead to your death, why do you still care what he thinks? No one is actually willing to stand up against his word and help save the lives of their peers. When the leader turns up to the not-so-secret meeting everyone talks very calmly and meekly, and just watches as he stuns Data. Is this someone you want as a leader? Even if his grandfather was heroically crushed by rocks building an aqueduct. It's easy to feel mild contempt for these idiotic people, but I suspect they represent us, as a whole. There's no obvious or heavy-handed parallels with current affairs, but I think this is a commentary on modern society. If you look at something like global warming, for example, you see much the same kind of behaviour from leaders and the led, but with less convictions and principles. Picard got chance to listen to Data's violin concert and says it shows feeling. Data explains, for the second time that day that he doesn't have feelings, he's just imitating other violinists. Picard counters by saying that the musicians he's imitating are entirely different, yet he blends them. Data concedes that he has learned to be creative. I feel that Data has convinced himself that he doesn't have feelings and is reluctant to accept compliments. As the first section made clear, if you believe something about yourself enough you probably make it true. Something I can identify with. When you read British urban fantasy it's difficult to get away from London. It makes sense, London is by far the biggest and most famous UK city. There's a lot an author can do with London, but I have noticed certain trends that appear regularly within this particular subgenre. 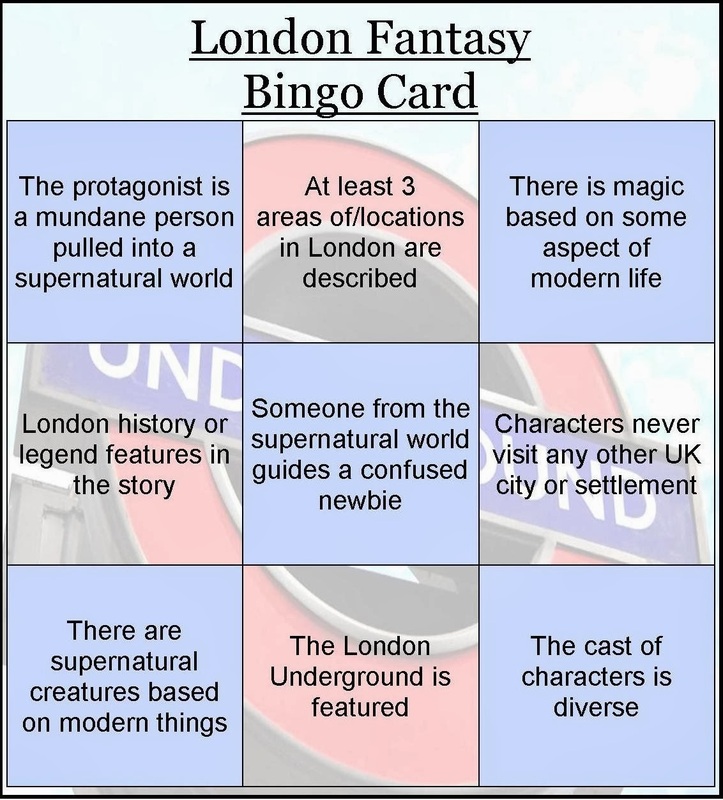 For the purposes of this post I'm not so much looking at the various historical fantasies and alternate histories set in London, its more about fantasies set in modern or contemporary London. Some of these scores a bit rough as I'm scoring from memory, so it's possible a few of the above would actually score higher if I read them again. I can think of other books I haven't got around to reading yet, and I expect there are even more examples I haven't even thought of. If you get a score for a book that I haven't mentioned here do let me know, especially if there's a book that gets a full house. 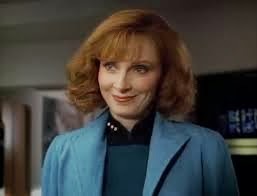 Beverley Crusher is back! 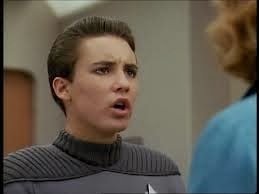 Wesley Crusher has normal, teen reactions. Dr Kelso tries to reduce the hospital budget by launching an egg into a space explosion (I think). Already an improvement on series 2. Beverley worries about Wesley. Stubbs tells the lad about the concept of wunderkind and the burden of fulfilling your potential. Red Alert sounds, a Borg vessel is detected, but can't be seen. It sounds bad but you can tell there isn't really a Borg attack because the music is wrong, its spooky rather than action-packed. Then the Computer starts reciting chess moves. Stubbs insists his experiment must not be delayed. Geordi technobabbles about hotwiring the ship because the systems are disintegrating. Wesley is supposed to be in quarters, but he crawls around 10 Forward, setting traps. He tells Guinan he thinks the problems might be his fault, because of a nanite experiment he was doing that got loose. Big band music plays loudly across the ship, and Picard has to shut off the Bridge power to stop it. Stubbs is sad and angry about his experiment, and lectures Wesley about baseball and impatience. Beverley and Wesley have a real discussion about his responsibilities and her absence. Beverley and Wesley explain about the nanites. Stubbs wants them killed so he can do his work and is deeply confused when crew members suggest they're an intelligence that shouldn't be destroyed. Picard tells Wesley to work with Data to remove them safely. Stubbs interrupts Data, Geordi and Wes to shoot at a section of Computer killing the nanites there. Horrible gas floods the Bridge. Data points out that Stubbs' actions prove intelligence, as they responded to his attack. 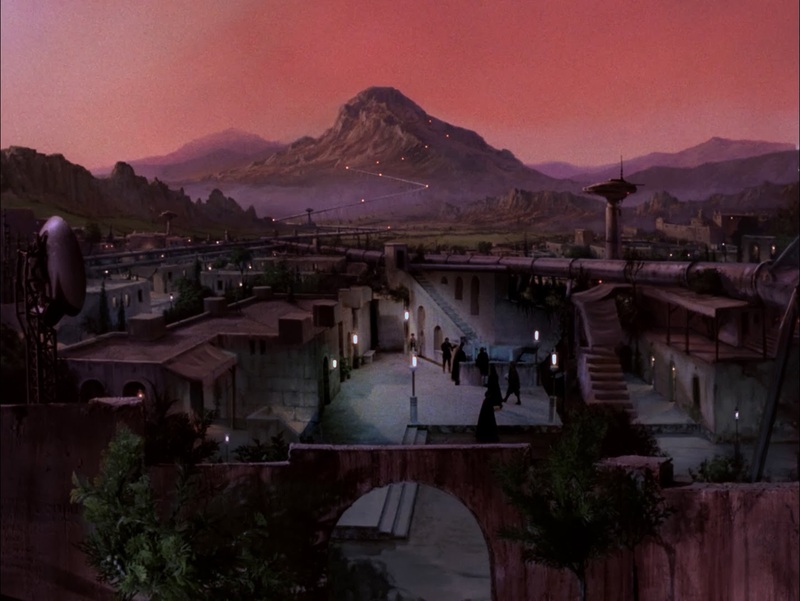 Stubbs is confined to quarters, and Picard tells Data to find a way for them to communicate with the nanites. Troi talks to Stubbs, who is scornful of her touchy-feely approach. Later a console attacks Stubbs with blue lightning. Data volunteers himself as a conduit so Picard can hold a peace conference. Picard speeches about peaceful co-existence and the nanites explain that they were exploring and meant no harm (which is convenient). Picard creates fellow feeling by saying that he's an explorer too. Stubbs is made to apologise for mass murder and the nanites agree to end the conflict. They don't need assistance anymore, they want to leave the ship as it's too confining. Data is returned unharmed. Stubbs sorts out a planet for the nanites and is successfully able to do... whatever it is. Its young(er) Dr Kelso from Scrubs. Ken Jenkins plays Dr Stubbs, a Star Fleet scientist who has spent his life working on an 'egg' that will do... something. Its very important that his experiment is launched in time for the solar explosion in this specific binary star system, because it only happens once every 196 years. Picard is happy to give professional praise about Wesley and compare the lad to his father, but is distinctly uncomfortable and uncertain when asked about Wesley having a personal life. Then again Picard doesn't seem like the kind of boss who wants to know about anyone's personal life, he's got captaining to do. Picard makes clear that his first priority is not some guy's science experiment, it's the safety of the ship. It's not even like the experiment involves lost civilisations or fascinating ancient artifacts. It's the Captain's prerogative to endanger the ship for his interests, and his interests alone. Picard tells Data to find a way for them to communicate with the nanites. Because how is Picard supposed to solve a problem unless he can make a speech at it? Dr Crusher is back! Hooray!! No one mentions what happened to Pulaski, its probably not important. I respected Pulaski, but I didn't like her as much as Crusher. For all that she was shown to be compassionate, Pulaski would sometimes make a decision about whether or not people counted as human and wouldn't change her mind, like with Data and those clones. Stubbs comments on the mother-son Crusher team and asks whether Wesley ever has fun. Beverley realises that after a year she doesn't really know the answer to that question. They clearly haven't bonded since she returned, Wesley is too polite with her, and she worries. She speaks to Picard about Wesley and both the Captain and the Doctor realise that they were getting into trouble at 17, and Wesley just doesn't. Beverley tries to talk to Wes about taking on too many responsibilities, and he confronts her about being away. (Well, its the TNG equivalent of a parent-teenager confrontation, there's no shouting or sarcasm and little anger.) Beverley offers her help and she tells the senior staff about the nanites. At the end Beverley sees Wes with some brightly-dressed young people. Her worries assuaged, Beverley can adopt a mother role she's more comfortable with. The show finally acknowledges that Wesley doesn't behave like a normal teenager and maybe that's a cause for concern. I suppose not having his mother around meant he was being raised by a group of people who are there in a professional capacity. There wasn't any family time and all the interactions we see are between Wes and adults. He's driven enough to aim for the Academy and since that's an area where all the officers could easily encourage him that's become the focus of his life. When Beverley suggests that he's taking too much on he's understandably annoyed. He's been doing so much, more than anyone expected, and yet he feels like he's facing criticism for that. It's also no surprise that Wesley throws his mother's absence back at her (though it was his choice to stay on the Enterprise). Of course -this being a utopian future with no interpersonal conflict- the anger and tension immediately dissipates. Beverley offers her help and Wesley accepts it. Still it was good that they had this scene. Wesley effectively creates life (or intelligence) in this episode, but there's no smugness or superiority or people going on about how damn smart he is. There's just a mistake that goes badly wrong and needs to fixed. In a very normal teenage reaction he tries to sort it out himself in the hopes that no one will find out and he won't get into trouble. Initially he only confides in Guinan (who's outside Star Fleet and conventional adulthood), she points out that maybe he's been too smart for his own good, like Doctor Frankenstein. At the end Wesley socialises with some other young people, the implication being that he does have friends, so that's alright then. 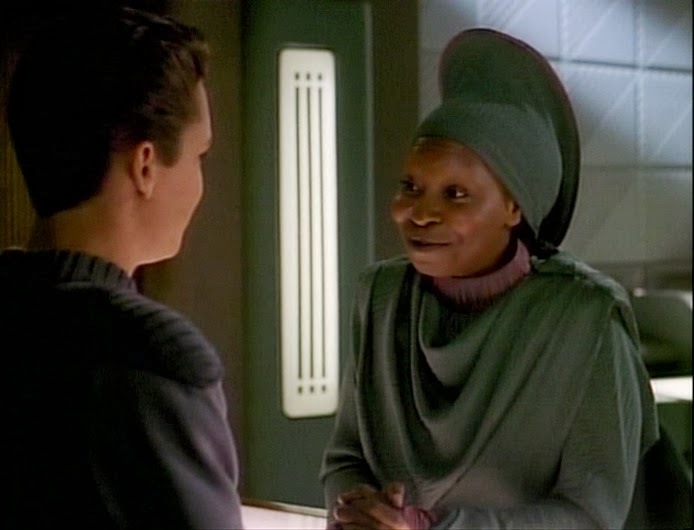 Guinan tells Wes that she's no good at being confined to quarters, as her husbands will attest. She asks about Wesley's problem and there's no suggestion that she'll report it to anyone. Guinan claims to have known Doctor Frankenstein, and I'll believe her because she's basically like a wiser, less-flashy combination of a Time Lord and a Jedi. Wesley: I always get an A.
Guinan: So did Doctor Frankenstein. When talking to Dr Crusher at the end of the episode Guinan reveals that she's had lots of children, but only one she didn't relate to. It took several hundred years, but she managed to bring him round. The ship is very vulnerable because they can't trust any external data or rely on weapons while there are so many system failures. In fact its a mercy that life-support isn't threatened. Worf points out that allowing unknown creatures, who have shown an understanding of hostility, to basically possess/infect a Star Fleet Commander is a great threat. Everyone ignores him because they can't be bothered to run malware scans on androids. Plus by that point the nanites have already infected their entire environment, and its not like Data even has lasers or anything. 1. Picard, Data and Riker go to the lounge to discuss the system-wide failures. Troi and Stubbs turn up, Stubbs wants a briefing because this is his only chance to do... whatever it is. Picard understands, but must ensure the safety of ship and crew. Stubbs would rather die than leave his experiment undone, he's also rude about Troi's empathy. 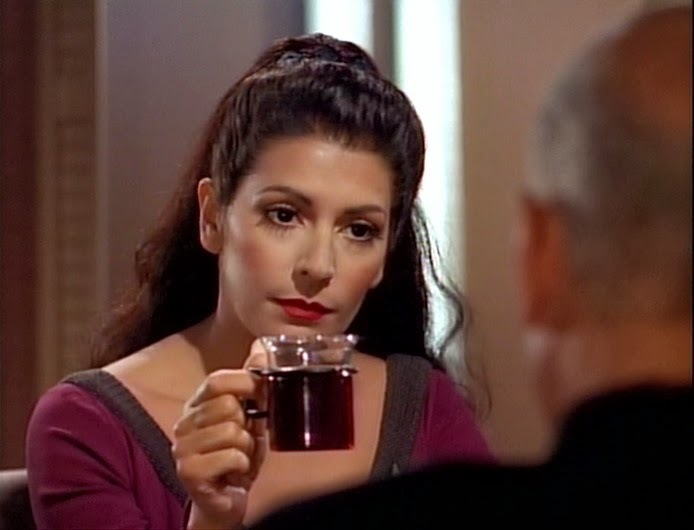 Troi tells Picard how driven Stubbs is, though Picard had already figured that out. 2. Beverley tells Picard, Riker, Data and Stubbs about the nanites. Wesley explains that his nanites evolved, the computer hardware is their food and they've started multiplying, apparently evolving as they do. Stubbs suggests an exterminator. Beverley points out they're a collective intelligent, and Stubbs points out that she kills diseases, germs and other lifeforms all the time. Picard tells Wesley to work with Data to remove nanites safely, but stronger measures may be needed later. 1. If something is meant to be kept in lab conditions don't take it to your room, otherwise you might accidentally endanger the lives everyone you know. Of course, if nothing really bad happens you probably won't be punished. 2. Don't stake your entire life on one thing, because if that doesn't pan out you'll probably go crazy. 3. Guinan: A mother shapes her child in ways she doesn't even realise. Sometimes just by listening. 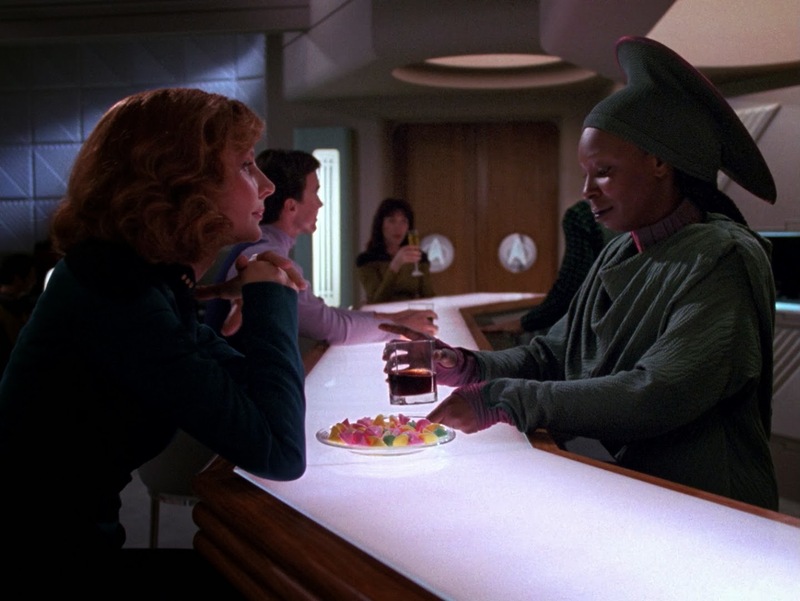 Beverley has a chat about motherhood with Guinan. She sees Wesley with his arm around a girl, in a group of young people and comments on how healthy that is. Then she asks Guinan who that girl is. * Book recommendation: the subject of being a prodigy and the pressure that comes with that is a major theme of An Abundance of Katherines by John Green, which is a great YA book. Here's a list of books that are either already on my to be read pile (physical and electronic), or are likely to be added to it when I get around to spending my Xmas money. Plus I'm sure many of these books will be available through the library service too. The books are presented in no particular order, and I'll update what I've read as I go. And to think my husband says I don't want things. Though to be fair, he was talking about things other than books and DVDs, and I must admit I find I don't tend to want other stuff so much. This actually looks like a lot of books, though I don't normally do lists like this, so maybe that's it. I wonder if I'll manage to read them all? Stay tuned to find out. It's that time of year to do a bit of planning and looking forward, as well as a little looking back. This year I want to get more organised and rather than coming up with vague resolutions I'd like to have actual plans and goals in place for myself. I realise that I'm the kind of person who needs a structure in order to be effective, so I'm coming up with that at the moment. I'm hoping to be a bit more organised with blogging too, I enjoyed doing the Sandman reread earlier, but I think I could have planned it better. January might be a bit quiet in these parts while I get a few things sorted out. Of course other people's plans aren't particularly interesting and a lot of what I've come up with so far is written in shorthand that only I'm meant to understand, so I won't be posting a list here. Instead I'm going to start positive and mention some good things that will be happening this year. Fox Spirit Books are publishing a pair of anthologies early this year featuring female characters in apocalyptic short stories. My story 'The End of the Garden' will appear in the first volume, it's definitely not your usual end of the world story, it's narrated by a hedgehog for one thing. Both books will feature an impressive range of stories and I'm really interested to see what the talented folks on those lists have come up with. You may remember me mentioning Fox Pockets (the small but perfectly formed mini-anthologies from Fox Spirit Books) back in June when my flash fiction story was published in the first volume: Piracy. Since then the second volume, Shapeshifters, has been released, and very fine it is too. My story 'My Guardian's Guardian' is due to be published in the Guardians Fox Pocket later this year. In August this year I shall be attending my first Worldcon, since its going to be happening in the country I live in. I didn't do many conventions in 2013, deciding to spend a bit of money on a holiday to Greece instead. I've heard mixed reports about recent Worldcons, but as they are run by different people in different locations and (this year) in a different country I'm going into Loncon3 expecting it to be its own event. A lot of friends are going, so if nothing else it'll be a good opportunity to catch up with people and hopefully make some new friends too. Looking back at the resolutions I made last year. The most successful resolution was get a new job, which I achieved in April and has been going pretty well since then. Have more fun and be more creative are, in retrospect, well-intentioned and tricky to judge. I did have fun and was creative in 2013, but at this point I'm not sure if it was more than 2012. I think overall I felt better in 2013 than 2012, so I'm calling that a vague win. Blog about TV more is a resolution that happened in an unexpected way. I unintentionally stopped blogging about books for about 6 months. This means that the percentage of TV posts compared to book posts went up, but not in the way I wanted. I'm honestly not sure if I did get better at punctuation, sentence structure and grammar. I might have done but I don't feel that I put much effort into it so I cannot say that I achieved that resolution.